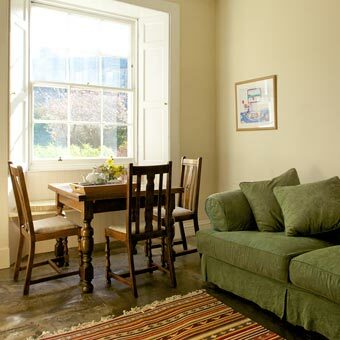 Period Georgian self-catering rental accommodation in Edinburgh. Unrestricted free off road parking at rear. Spacious, central apartment with free parking. Sleeps 2 plus child. The blue door in the middle is the owners' front door. The entrance to the apartment, the red door, is down the steps to the left. "The flat is beautiful - it's all in the detail." England. "A lovely oasis in the city." USA. "We have stayed in many self catering apartments but yours is a class apart." Canada. "A delightful Georgian apartment furnished in a most tasteful and artistic style." Romania. "We found the perfect place for our dream vacation in Scotland." Germany. 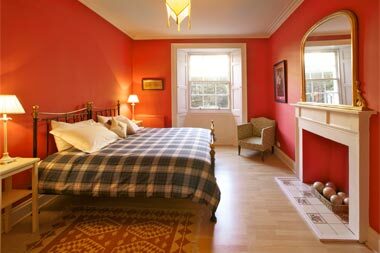 "After three trips to Edinburgh we can say without a doubt that this was the best accommodation in every respect." Australia. "Once again a superb stay - we so love it here." England. Windsor Street, a quiet classical Georgian terrace in the heart of Edinburgh, was designed in 1822 by William Playfair, one of Scotland's greatest architects who excelled in bringing to Scottish Georgian architecture a sense of Classical Greece. 19 Windsor Street was restored in l997 to create a spacious, elegant family home. 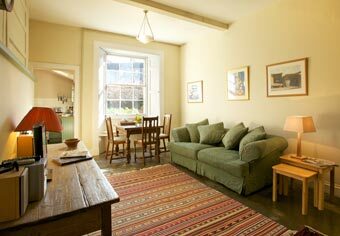 The lower ground floor has been sensitively restored into a contemporary, stylish, warm and comfortable apartment. 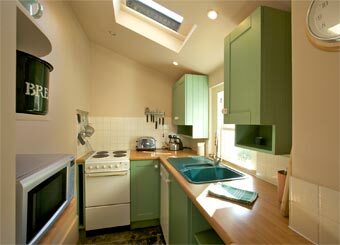 The owners live upstairs and provide a particularly warm welcome and are on hand with helpful advice and information. And there is the added (and rare) advantage of free off-road parking at the rear of 19 Windsor Street available for the use of guests. 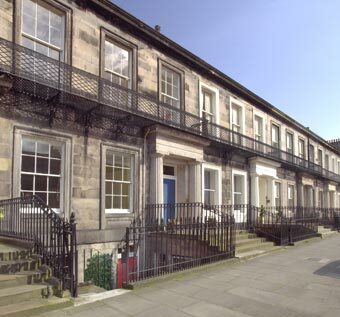 This is a wonderful opportunity to stay in a period Edinburgh home which is within easy walking distance of the major attractions of this great city. The apartment is self-contained from the upper three floors of the house and is accessed by steps from Windsor Street. There is a pretty flagstoned patio area to the front with plants and garden bench (left). Above and right; Morning sun streams into the living room where a dining table is placed by the shuttered windows overlooking private walled gardens. There is no passing traffic, just the call of the birds which makes Windsor Street a particularly peaceful place to stay. Colour television, video, CD player, radio and tape machine are all available. The floor is polished original Caithness flagstones. Below, left and right; The bedroom has shutters at the windows, a polished wood floor and antique brass beds which can be prepared as twins or one luxuriously large king sized bed with crisp cotton bed linen. 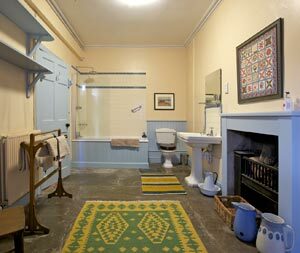 The bathroom is wonderfully spacious with an open fireplace, Caithness flagstones with warm rugs and a deep metal bath with an overhead shower, WC and a handsome wash basin. A generous supply of towels is provided – and bubble bath and revitalising bath crystals. Guests are able to get internet access for laptop use. The kitchen (left) is accessed from the sitting room and is well equipped with cooker, microwave, dishwasher, fridge and freezer. 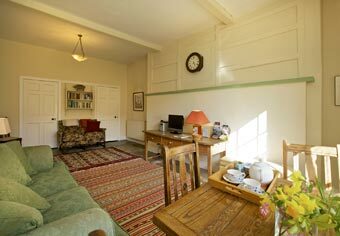 Prices from £80 for one night, with a minimum stay of 2 nights. "We are continually delighted by the warm appreciation of all our guests who visit Windsor Street from all over the world. We aim to provide a home from home in a peaceful central location." - Deborah Galbraith. 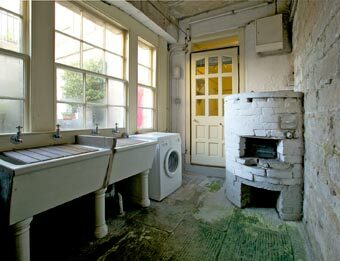 Just off the bathroom is the original wash-house (right) with deep handsome washing sinks and old 'copper' giving a insight into the work of the household staff on washday in the early 1800's. Today, for guest's use, there is an automatic washing machine. Please tell Deborah you found Windsor Street through About Scotland!